Deciding when software is ready to be released is a really difficult. Developing software seems never ending process and as the stakeholders gets hands-on with the software; there are always new ideas and feature requirements. From users and sales team, you have pressure from all sides to release perfect software, with added features and in short span of time. Every organization whether startup or established company is facing the problem of getting something developed which is dumped due to requirements not met, developers did not listen, coded with developer’s perception, too many bugs, delayed etc. In all such cases, finally the development cycle terminates and the software is nicely shelved or the process to look-out for another developer starts; but the end result remains the same. The issue is not with development. Whereas, it lies with how the development was executed started from understanding the needs, brainstorming and revisiting. Of all resources, there is no resource which is more valuable than time. Time is the most valuable resource than money, even for software development. We understand that there is no specific release criteria or game-point to decide, but keep releasing the application frequently or regular intervals (even with lesser new features or upgrades), keeps the sales team and users in sync and trusted with the organization. 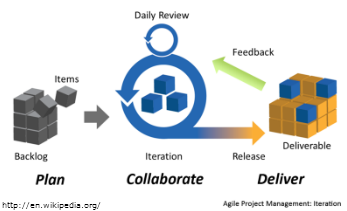 This is exactly what Kenovate Solutions exercise and excels for its agile development procedures.